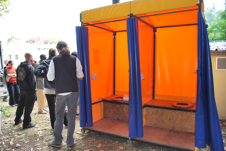 Skat provided input in the sanitation workshop organized by Action Contre la Faim (ACF) in September 2008 in France. The workshop was targeted towards ACF local staff and program managers from around the world. Skat provided an introduction to global sanitation issues as well as input on the selection of sanitation options and on the link between sanitation and health. Besides presentations and discussions, the participants had the opportunity to gain practical experience by building their own latrine that was then used during the one-week workshop.